Today I thought I would share a few high-end products that I am considering purchasing at some point. 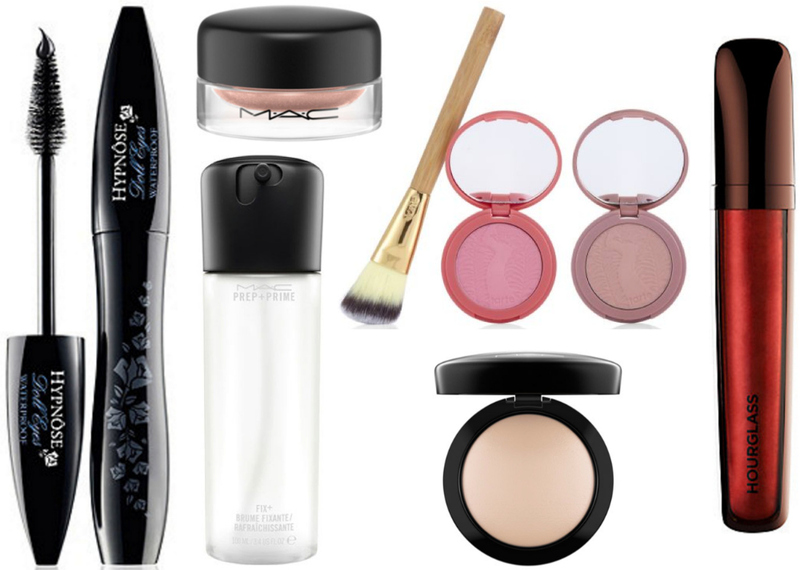 I have seriously cut down on the amount of makeup I’ve been purchasing recently, and rather than buying a lot of high street products on impulse, I have really thought about which high-end products I would get a lot of use out of. First up, I want a mascara to take with me on holiday in September, and so I thought a waterproof one would be the best option. I have pretty sensitive eyes and also wear contacts so Lancôme’s Hypnôse Doll Eyes waterproof mascara seems like the perfect option, and a couple of colleagues have reassured me that it doesn’t irritate sensitive eyes. Next up is an item I have already used and will continue to repurchase – MAC’s Prep + Prime Fix+ spray. I absolutely love this product. I use it to set my foundation and powder, to refresh my makeup throughout the day and it’s also brilliant for using eyeshadows wet. I’m all about saving time in the mornings when getting ready for work, and I have found that cream shadows are wonderful for quickly applying a wash of colour to my eyelids, making me look just that little bit more together each day. A MAC paint pot in the shade Vintage Selection would be the perfect everyday shade, it’s a gold, peachy brown that looks very wearable and suitable for the office. I really want a shimmery, metallic red lip colour to wear on evenings out, and the only one I can find that looks like what I want is this extreme sheen lip gloss from Hourglass in the shade Siren. It’s a warm red with a ton of shimmer and just looks beautiful… I imagine this would look great with a tan so I may possibly pick this up on my holiday if they have it in Sephora. I could kick myself for not buying a Tarte blush when I was in Sephora in Las Vegas. My friend Mary kept telling me to, but the price put me off. Then my friend Catherine got me a little gift set with a mini size blush in and I’ve absolutely loved using it, so much so I’m about to hit pan, nooo! Tarte isn’t the easiest brand to get hold of here in the UK, but QVC have a Tarte set with two blushes in the shades Exposed and Fearless, and a free brush, making this a really good deal. I desperately want to pick this up as I think Exposed is the shade I would love the most. I’ve been looking for the perfect setting powder that doesn’t make my dehydrated skin look cakey, and I keep coming back to MAC mineralize skin finish natural in the shade Light as the one I really should try. This may be yet another holiday purchase from duty free! I know these are not the most exciting products, but I do think I’d get so much use of out them. However at this moment in time I don’t have the money to buy any of them seeing as all of our spare money at the moment is being spent on our house renovations and saving for our holiday… So for now, this will remain a wishlist only! * All links correct at time of writing.